Freight volume handled at the terminals of JSC Sea Port St. Petersburg (Sea Port St.Pb) in January-June 2015 increased by 5% from a year earlier to 4.3 million tonnes, the stevedoring company's press service said. The company said the growing trend in throughput was fueled by a 12-percent spike in general cargo segment to 3.5 million tonnes. In particular, thanks to increased steel exports by metallurgical enterprises of Russia the volume of ferrous metals handling at the terminal of the stevedore jumped by 28% to 1.5 million tonnes. Shipments of non-ferrous metals through the port increased by 24% from H1 2014 to 800,000 tonnes, primarily thanks to aluminum exports. During the reporting period, there was a 36-percent slump in Ro-Ro cargo volume, to 193,000 tonnes. The decline in the segment was attributed to shrinking imports of automobiles to the Russian car market. Handling of bulk cargo decreased by 19% to 800,000 tonnes, mainly due to a 41% drop in mineral fertilizers volume to 300,000 tonnes on the back of redistribution of fertilizers to dedicated terminals in Russia and in the Baltic countries. Exports through the terminals of Sea Port St.Pb in the first half of the year increased by 8% on H1 2014 to 3.7 million tonnes, while imports fell by 13% to 600,000 tonnes. The share of exports in six-month throughput was 85%, imports accounted for 15%. 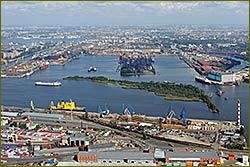 JSC Sea Port St. Petersburg (part of UCL Port, a stevedoring division of the international transport group UCL Holding) is the largest stevedore offering services for handling all types of dry cargo in the Big Port St. Petersburg. It operates modern multipurpose terminals for general and bulk cargoes, and Ro-Ro dedicated terminals. In 2014, cargo throughput of the company reached 8.1 million tonnes. Business news archive for 17 July' 2015.
Business news archive for July' 2015.
Business news archive for 2015 year.